Academy Events and Fireball are pleased to reveal the regional winners of Fireball’s Hottest Band 2019 Competition in association with Kerrang! Magazine, who each go on to open their local date of the ‘Fireball – Fuelling The Fire’ Tour 2018. Whittled down from over 350 entries to this year’s competition, the final 10 bands were selected from the 30 successful winners of the first round at the recently-held regional heats across O2 Academy venues around the country. Commenting on this year’s regional winners, Fireball UK brand manager James Pattison said: “It was, again, a really strong year for applicants to open the Fireball Fuelling The Fire Tour. The eventual winners all deserved their places respectively on the tour with some fantastic performances to boot, but the support that the bands all gave to each other was the real champion of every night. The scene is still thriving, and that’s why we wanted to turn this process into an evening of some drinks on us and put these bands in front of some of the UK music scene’s influential individuals. Each date was judged by a specialist panel comprised of members from Kerrang! Magazine, Fireball and Academy Events, alongside local music industry experts in each city. The overall winners of the competition will be selected at the end of the tour from the 10 regional finalists, and will be crowned Fireball’s Hottest Band 2019, appearing as the opening artist for the entire tour next year. 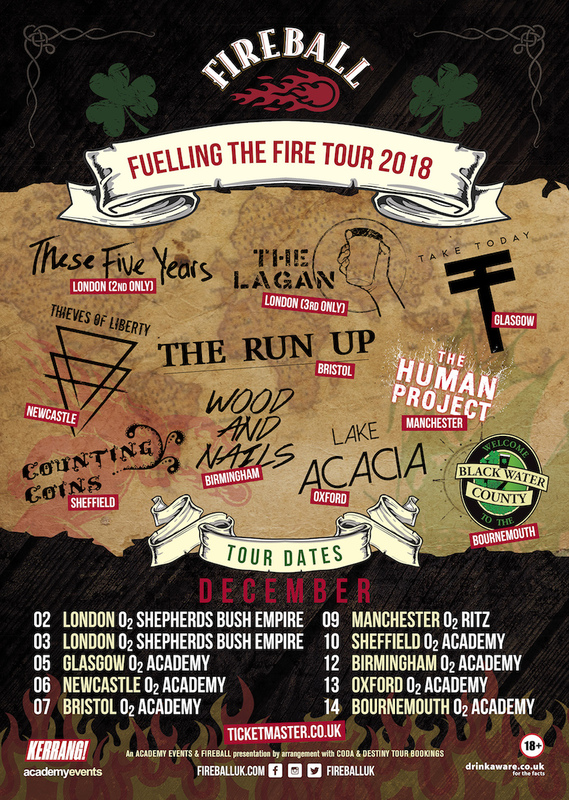 Hitting the road throughout December 2018, the ‘Fireball – Fuelling The Fire Tour’ will feature a star studded lineup of the best in punk music, with The Bronx recently joining previously announced headliners in Celtic-punk legends Flogging Molly, So Cal punk veterans Face to Face, and the Glasgow pop-punks from Fireball’s Hottest Band 2018 Lost in Stereo.